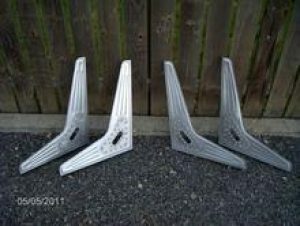 Bomber seats gained popularity back in the 1950’s when hot rods were being built with surplus parts and automotive design was heavily influenced by the engineering and parts used on airplanes. Surplus military bomber seats were a common upgrade into home-built hot rods. This style and influence still remains popular today and provides that nostalgic hot rod look lots of hot rods are built with. Our Bomber Style Seats are perfect for a real hot rod that actually hits the road! You won’t just have the bomber seat style, but you will have much more of a comfy ride as well (as most original bomber seats do not have any cushion or padding available). 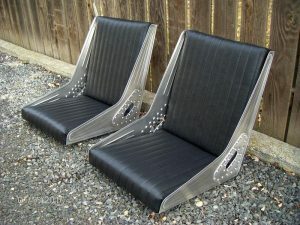 The Bomber Style Seats are typically sold in pairs and are available in red, white or black with a vertical pleat formed by heat on the vinyl and black with a diamond stitch pattern. We use new, high-quality upholstery foam padding that provides good support at two inches thick. Our Bomber Style Seats are made from .060” aluminum sheet and 3/4” cabinet grade plywood with real aluminum rivets. The dimensions are approximately 19” deep, 22” tall and 18” wide with a 13 degree lay back. The bottoms have six 3/8” coarse thread holes that you can use for mounting your seats. These seats are not perfect, show quality seats. They may have some minor tool marks, light scratches, and could need light de-burning, but that is why they are a fraction of the cost of most other seats offered currently. The seats are 100% built in the USA – right here in our own shop in Idaho. We can also make custom width seats upon request if the standard size doesn’t work for your particular application. 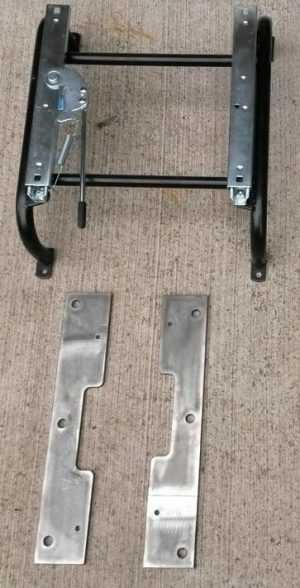 Bomber Style Seat Frame: Purchase just the seat frames to make your own custom bucket or bench seat. They are the exact same sides we used in our fully assembled seats. These are also sold as a set of sides (right and left), but if you are looking to make two bucket seats, we have a package deal for 2 sets of sides as well. 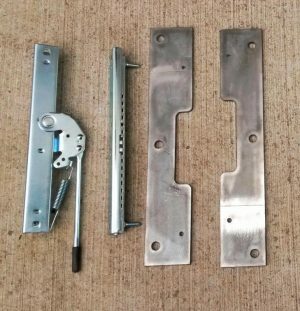 Ford Model A Door Panel: This is a unique and affordable way to finish your interior side of your Model A doors. They are available in red, white or black upholstery with a vertical pleat to match our Bomber Style Seats. We make panels to fit: 1928/29 Coupe & Sedan, 1928/29 Pickup, 1928/29 Roadster, 1930/31 Coupe and 1930/31 Pickup & Sedan. These are also made of .060” aluminum sheet metal with a pleated vinyl panel attached with a riveted aluminum piece. The door panels are designed to fit stock applications as listed but they may require some minor trimming and fitting to be exact, as production varied slightly with different body manufacturers. They are priced and sold as a pair of door panels. Seat Slider: Add this kit to your order for a complete set of adapter plates and sliders needed to make our bomber seats adjustable. The kit includes all the parts for one complete seat so you will need two kits if you are ordering to match our standard pair of bomber seats. Riser & Slider: Do you want to make your bomber seat higher and slide? This is a complete set of adapter plates, riser and sliders needed to make our bomber seat fit your project. The kit includes all the parts for one complete seat so you will need two kits if you are ordering to match our standard pair of bomber seats. Our product line is driven by our passion to create unique parts for customizing nostalgic rides, hot rods, customs and we welcome customer requests. Our goal is to support do-it-yourself hot rodders and the aftermarket automotive industry with quality products and services that enhance your building experience and save you time and money. Cold-Rolled Steel Mandrel Bends: These mandrel bends help you with building custom headers, intakes and exhaust systems for your project. Exhaust Kits & Accessories: Take a look at your exhaust kit options and accessories for more complete kit options and variations. Exhaust/Header Flanges: We have the most extensive line including over 40 different flanges to choose from and support 100+ engines from 1925 through present. Full-Welded Intakes: We have custom fabricated multi-carburetor intakes for Buick, Chrysler, Desoto and Dodge Hemi. Intake Flanges: These flanges allow for custom and unique intakes to be fabricated. 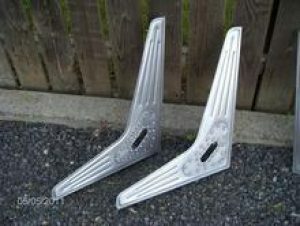 Straight Lake Header Kits: Build your own lake headers using our kits including all the required parts in one package. It’s the easiest style of lake header to fabricate for the DIY builder. Swept Lake Header Kits: Allows for all primary tubes to “sweep” back into the megaphone for a more stylish and better flowing lake style header. Services we currently offer in addition to the products listed on our website include custom part engineering, design and manufacturing, fabrication and TIG/MIG welding, hot rod and custom car building and small production runs for your own company’s product line. We want to keep traditional hot rodding alive. See you on the road!